I have been watching the discussion, jokes, and expert opinions about Dr. Creflo Dollar’s (Pastor of the World Changers Church International in the Atlanta area) request for money to buy a top of the line jet. I think that the problem that many have with it is not necessarily the need for a plane – it’s a plane of that order and that type. What was probably a great idea in a planning and creative session (which mega ministries have) backfired because somebody either didn’t say or was overruled in the wisdom of putting this down on video and letter to ask for a first class jet that only the super-rich possess. The downside of this has become all of the chatter, criticism and last night during The Nightly Show with Larry Wilmore, one of the ministers of the television reality show, “The Preachers of Detroit” greatly rebuked Dollar and the panel basically made it sound like the poor was being pressured into giving – when the truth is that poor folk aren’t the only ones who give to his (or any other mega ministry) because he clearly said it was sent to his congregation AND his worldwide donors list, which meant these were the people who had already been giving. This debacle has made the words “those preachers” become inclusive of most of us who don’t drive or own luxury cars, live in fancy homes or have congregations that pay us six or seven figure salaries. Most of us struggle, to be honest. Those of us who went to school haven’t gotten the appropriate amount of pay for school nor experience. Most of us deal with established boards who come to the table not with the spirit of the pastor’s vision, but their own brand of division. Not to mention a spirit of suicide that erupted in the Body of Christ last year which saw several pastors (none of those who pastored megachurches) end their lives tragically. I’m saddened by all of this, without a doubt. It’s been a long time since Jim and Tammy Bakker and other financial excesses have been public fodder. So, please forgive me if I don’t join in the chorus of those who are joyfully exploiting this situation with suspect glee – it’s saddening and disappointing on many, many levels. Since the public outcry, the campaign has been cancelled. This correspondence comes to you at the request of the Adjutant General, Bishop Matthew Williams. Monday, March 16, 2015, 7:00 p.m. The Adjutant General is requesting that all Hotel Accommodations and Ground Transportation needs for the General Board be emailed to me at rudolph@cogic.org on or before Saturday, March 14, 2015. The Adjutant General is requesting that all Bishops who will be attending the national celebration, please wear your “Class A” vestments. All National Adjutant brothers, who will be serving, please wear your “Class A” vestments. National Adjutant sisters who will be serving, please wear your white habits. Let us be in prayer for the Haynes family and the Texas Northeast First Ecclesiastical Jurisdiction during this most difficult time. If I can assist you further concerning this matter, please call my office at 501.712.0048. 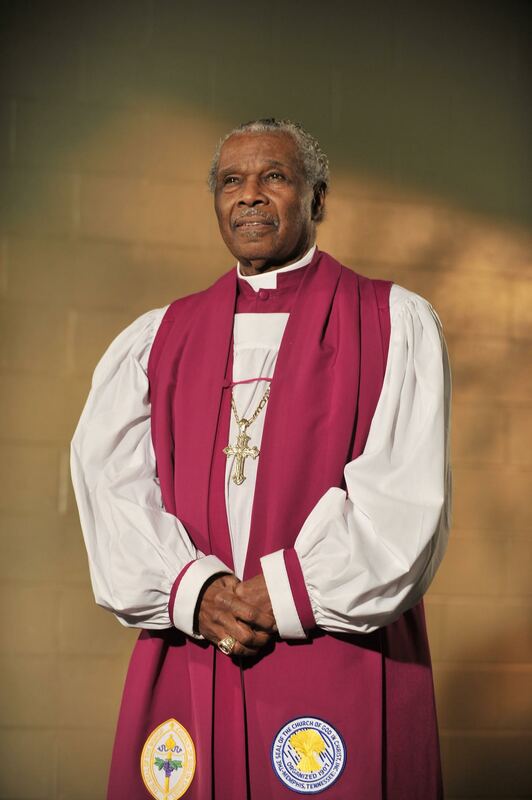 Bishop Robert G. Rudolph, Jr.
Bishop James Neaul Haynes (1932–present), the sixth child of the late Bishop F. L. Haynes and Mrs. Ola Mae Haynes, was born in Denton, Texas. He matriculated at the Denton Independent School District, graduating from Fred Moore High School with valedictorian honors. He then attended the University of Denver in Colorado, graduating with a Bachelor of Science degree. After graduating, he attended the Dallas Theological Seminary and he received a Honorary Doctor of Laws degree in 1986. Haynes began to preach the gospel in 1949, and was licensed as an elder in 1952 at the Open Door Church of God in Christ. He went on to become the pastor of that church. In 1962, he moved to St. Emmanuel COGIC. He also served as pastor at: Jackson Memorial COGIC, Wheatley COGIC, Haynes Chapel COGIC (which was named after his father, Bishop F. L. Haynes), and lastly Saintsville Sanctuary COGIC in Dallas, Texas. In 1967, he became a superintendent in the COGIC and was elevated to the office of Bishop of the Texas Northeast Jurisdiction in 1978. After becoming a bishop, he was appointed to the National Trustee Board of the denomination. In 1984, Bishop Haynes was appointed to the General Board of the denomination. In 1997, he became the Assistant Presiding Bishop of the Church of God in Christ serving under Presiding Bishops Chandler D. Owens , Gilbert E. Patterson , and most recently Charles E. Blake . In 2008, Bishop Haynes was not reappointed to the office of Second Assistant Presiding Bishop; however, he remained a General Board member. He officially retired from the General Board in November of 2012, and was declared an emeritus member of the General Board by Bishop Charles E. Blake on November 12, 2012. Bishop Haynes is currently married to Vivian King Haynes. From this marriage they had two children: Pia and Vrai Haynes. They also have two sons-in-law: Reginald Williams and William C. Morris. Bishop Haynes now has four grandchildren. There is a trend that is brewing in the Body of Christ and specifically in our pulpits that is troublesome. It is this new attempt to be “bold” and “brave” when it’s really no more than a sorry substitute for preaching. It’s the idea of using the pulpit to condemn, “put on blast” or destroy another pastor and his or her teaching. Many of us who have seen Preachers of Detroit have become disturbed at seeing ministers openly look into a camera and say what other preachers are not doing or not saying and it’s not just reserved for those who have cameras following them. I was aghast to see what has become a popular preacher in the evangelical community film “responses” to several nationally known preachers, denominations and labeling all of them either heretical or to pronounce them, just because of their worship methods, of “going to hell.” This must stop. I’ve discovered that you don’t even need a pulpit of significant size to make these bombastic charges. All you need is a keyboard, a computer, and an internet line, and you too can become one who can become an ad hoc member of the Sanhedrin Council. Sadly, many of those who demonize ministers, especially those with large or mega congregations, are wallowing in a sea of failure themselves. Their “message” is not popular, their preaching is not potent and it’s disguised with the phrase “people won’t come here me because I preach the truth.” That’s funny. Jesus seems to endorse “truth” as setting people free, and it looks like that kind of freedom would become popular. Sometimes the biggest critics are also some who get it wrong themselves. One critic of the modern church, who has publicly gone after preachers and denominations, himself has shrouded the fact that he has espoused doctrines such as “Christ’s sonship as a role he assumed in his incarnation” or “Lordship Salvation” or “Hyper-Calvinism.” Not to mention to suggest that the Charismatic movement be damned and that gifts ceased after the conclusion of the ministry of the Apostles.